This tutorial will help the user explore the CinemaScience ecosystem. It will discuss how to view Cinema databases (CDBs) with the standard Cinema Viewers. The CinemaScience GitHub page and the CinemaScience website are useful sources for more information and ideas. Note: Cinema databases should be viewed in Firefox to avoid cross origin security errors. The basic Cinema viewers operate on the Cinema Spec D specification. In each case, CDBs are assumed to reside in a data/ directory. Each CDB consists of a default data.csv file with columns of data abstracts following Spec D requirements (see CinemaScience Specifications), and any subdirectories needed for the data abstracts such as images, vti files, or additional csv files. The database viewers are described below. The data/ directory includes a test CDB, sphere.cdb with its required data.csv, and an image/ subdirectory with the images arranged into subfolders by the phi variable. The index.html file defines the set of databases to display in the dataSets variable. Edit index.html and modify dataSets to point to one or more databases. will bring up the CinemaCompare viewer. The sliders allow you to change the image size and the orientation. Edit the dataSets variable in index.html file to compare multiple databases. Multiple databases are not required to have matching variable ranges. The viewer will select the maximum range and display a default null image if one of the databases does not have that corresponding data row. Common Error Note: Mistyping a database name or forgetting the data/ directory part will result in a TypeError. Open the console window if nothing appears and check for the error. If so, check the dataSets variable in the index.html file for errors. Note that videos showing CinemaCompare for single and multiple databases can be seen on the CinemaScience Examples website. The default data/ directory contains subdirectories with example CDBs to illustrate the range of functionality of CinemaExplorer. Again, each CDB consists of a data.csv file and any needed subdirectories for its data artifacts. An image/ directory is common and the file_types.cdb includes a wavelet/ subdirectory with vti files that can be viewed with CinemaExplorer. databases.json follows JSON syntax rules. Each database entry minimally requires a name and a directory. 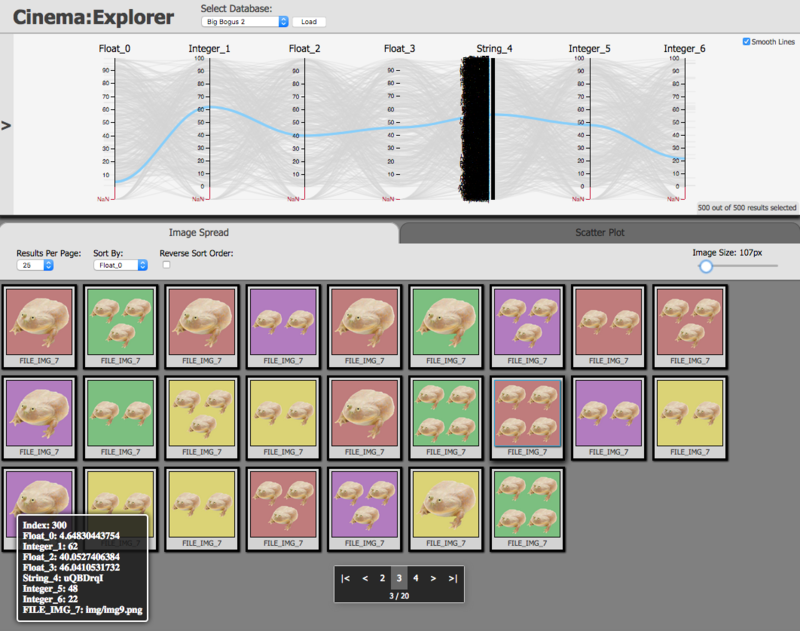 will bring up CinemaExplorer in a browser window. The default view has a parallel coordinates display of the data.csv columns. Each column corresponds to an axis. By default, the first database listed in databases.json will load initially. All databases in databases.json will appear in a dropdown menu under Select Database: in the CinemaExplorer browser window. After selecting a CDB, click on the Load button to switch to that CDB. Under the parallel coordinates, the default tab is the Image Spread component. The image spread includes controls to change the image size, the results per page, and the sort variable and order. Let’s switch to the Big Bogus 2 database. It has several additional axes of (bogus) variables and more images than can fit in a single page. 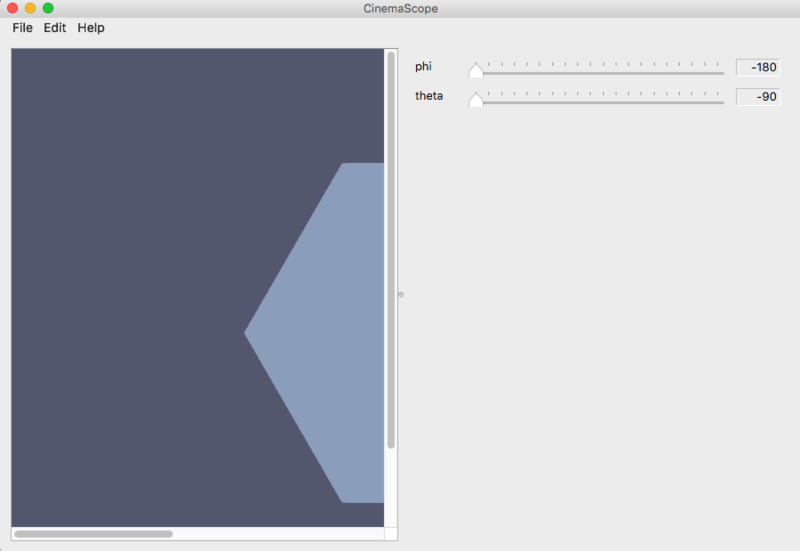 Note that CinemaExplorer switches between Canvas and SVG versions to accommodate the size of the database. The page navigation widget at the bottom of the Image Spread allows the user to cycle through all the images. 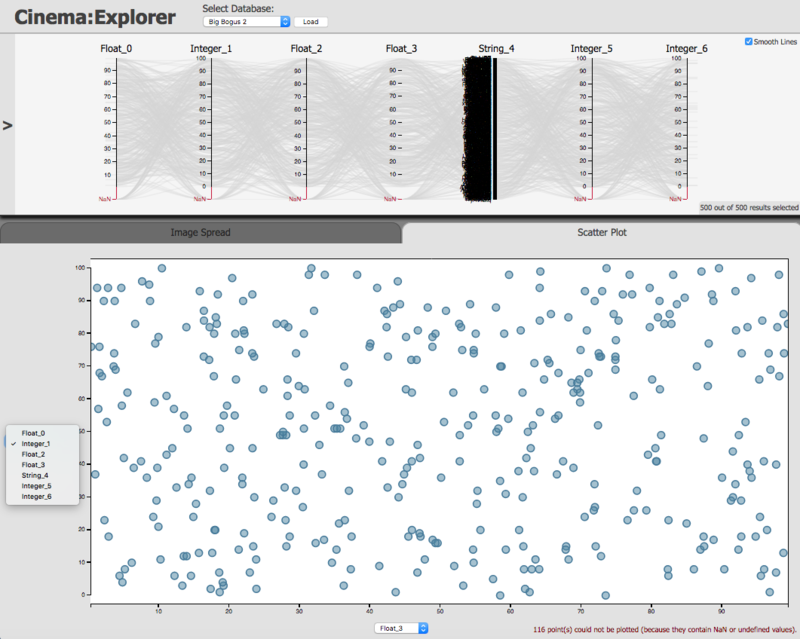 The second tab, on the right, is a ScatterPlot component. Each axis variable can be chosen from a dropdown menu of all axes so each variable can be plotted against any other variable. Another useful feature is a modal view. Clicking on a single image will bring up that image for closer inspection. Clicking anywhere in the main screen will dismiss the modal image. Here we select the image highlighted above. The selection can be cancelled by clicking on the previously selected axis. Selection on the axes is a particularly useful feature to, e.g., identify and explore outliers in the data. There are three optional control fields that can be implemented within the database.json file to control the data viewed on the parallel coordinates axes. Open CinemaScope after it has installed. Click on File -> Open to open the data directory and select the data set by highlighting test_cylinder.cdb (do not click into the directory) and clicking Open. This will load the test_cylinder CDB. The mouse wheel can be used to increase/decrease image size. Each parameter in the CDB data.csv will correspond to a slider. 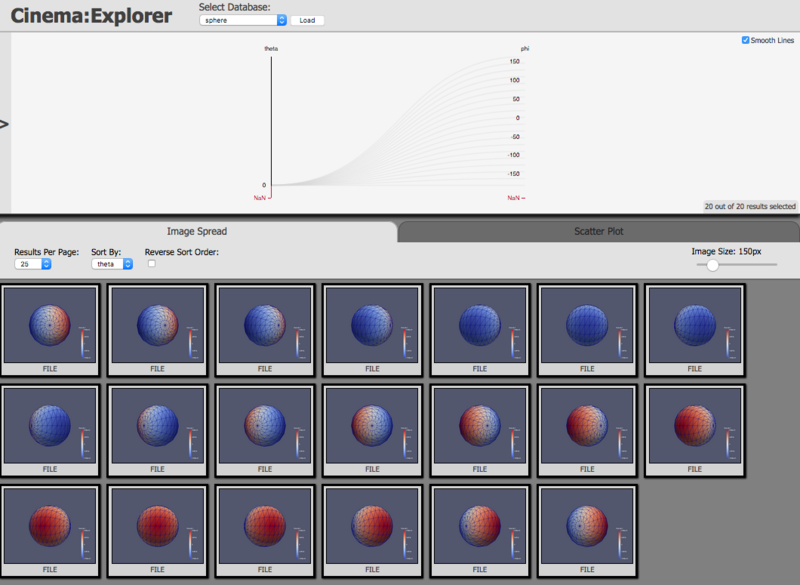 The sliders can be used to control the parameter values. In this case, changing phi and theta rotate the cylinder. Mouse drag can also be used to scroll through the images. Up/down is linked by default to theta while left/right is linked to phi. 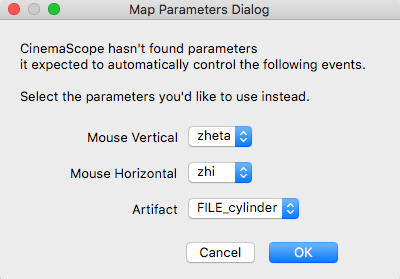 The linked parameters can be modified using the Map Parameters Dialog. Click Edit –> Edit Parameters to open the dialog and select the parameters from each dropdown menu. For CDBs with multiple artifacts, the Artifact dropdown menu will allow you to access each set of images. An optional csettings.json file, which must be located in the *.cdb directory, can be used to limit the number of parameters actually linked to a slider or reorder a list of parameter columns. The colorder (“column order”) variable contains the list of actively linked parameters. 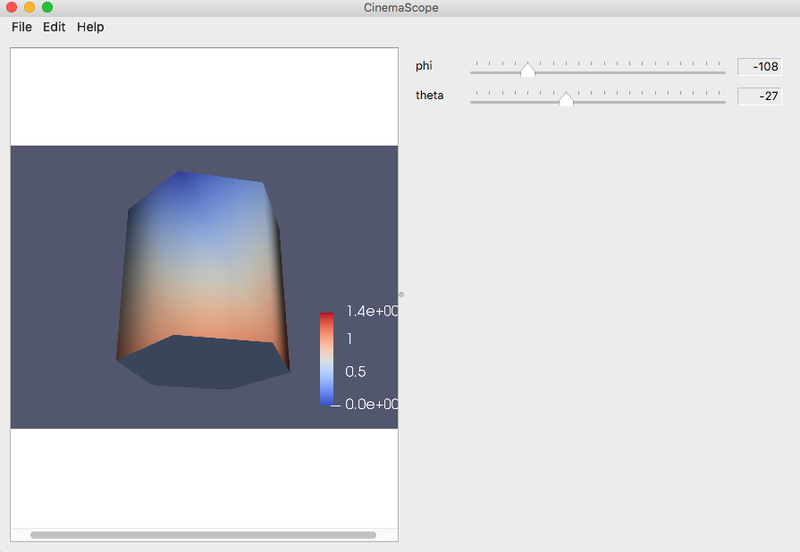 Additionally, there are other application-specific Cinema viewers that provide useful examples and inspiration for Cinema users and developers. 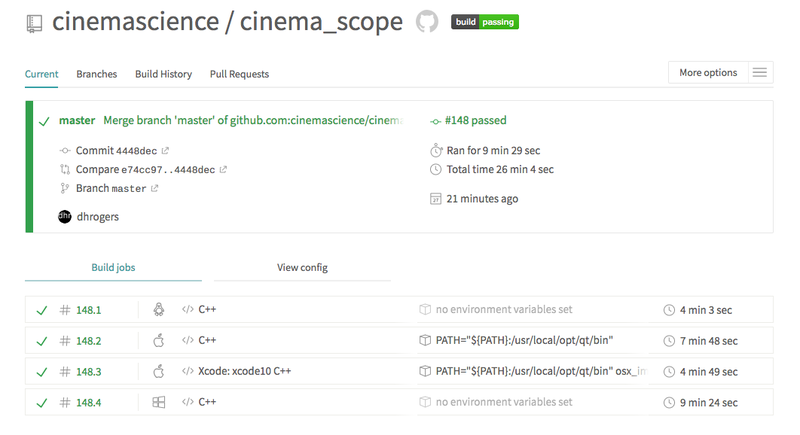 We invite you to explore the CinemaScience GitHub for an up-to-date listing of example viewers. Cinema Viewers, in particular CinemaScope, are in active development. We invite users to join the Cinema community and contribute to the Cinema project.